The Berea Fine Arts Club has been promoting local arts and crafts across northeast Ohio for over 80 years, and this year's schedule features even more great shows. Mark your calendars now, and we'll see you soon! Attention artists: art show application forms can be found at the bottom of this page. Attention students: download our scholarship application form by clicking here. Saturday, Apr. 27, 6 PM - 9 PM Join us for our anniverary art show featuring art for sale created by talented local artisans. The show is a free event and is open to the public. Wednesday, May. 8, 7 PM Our monthly meeting is a great opportunity to catch up on club happenings, hear committee reports, and talk about upcoming events. Saturday, May. 18, 10 AM - 5 PM The Front & Center Art Walk and Berea Fine Arts Club MayFest are combining to create BereArtDay, featuring two events on the triangle in downtown Berea including music, art, businesses, and more. Wednesday, Jun. 12, 7 PM Our monthly meeting is a great opportunity to catch up on club happenings, hear committee reports, and talk about upcoming events. Wednesday, Jul. 10, 7 PM Our monthly meeting is a great opportunity to catch up on club happenings, hear committee reports, and talk about upcoming events. Friday, Jul. 19, 9 AM - 4 PM The BFAC Kids Summer Art Camp is back for 2019 -- more details coming soon. Wednesday, Aug. 14, 7 PM In lieu of our monthly meeting, BFAC members are invited to join us for a club picnic at the Little Red School House. If you and your family will be attending, RSVP to Matt Richards. Monday, Sep. 2, Noon - 7 PM The Cleveland Labor Day Oktoberfest is proud to present Art Market and Craft Market. Art Market and Craft Market are separate juried shows, which between them will feature over 50 talented artists and crafters from Cleveland and beyond. If you love arts and crafts, come on out to the Oktoberfest where you’ll have the option to browse and even purchase works by some of the finest artists in Northeast Ohio. Please click here to download the Artist Application. Wednesday, Sep. 11, 7 PM Our monthly meeting is a great opportunity to catch up on club happenings, hear committee reports, and talk about upcoming events. Wednesday, Oct. 9, 7 PM Our monthly meeting is a great opportunity to catch up on club happenings, hear committee reports, and talk about upcoming events. Wednesday, Nov. 13, 7 PM Our monthly meeting is a great opportunity to catch up on club happenings, hear committee reports, and talk about upcoming events. Sunday, Dec. 8, 10 AM - 4 PM This holiday season, stop by our boutique-style Holiday Art Show in its lovely indoor setting at the Little Red School House. Our juried fine arts show helps you get a jump on your holiday shopping! 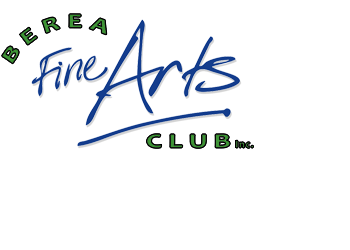 Berea Fine Arts Club, Inc.